Free cell formation, by managing positioning of wall- and membrane-forming vesicles to enclose volumes of cytoplasm to subdivide sporangia into spores. This is a possible branch point to plants if the phragmoplast is assumed to be a vestige of free cell formation and the cell wall was adapted to be a polymer of glucose rather than N-acetylglucosamine, possibly for economy in usage of reduced nitrogen in organisms abandoning heterotrophy. The beginnings of filamentous growth, first to make rhizoids or sporangium necks and stems, in the opisthokont cells of the day. Cell fusion, evolving from reversal of wall synthesis procedures and giving rise to cytoplasmic (vegetative) and nuclear (sexual) compatibility/incompatibility systems, including the evolution of gametes. Septum formation, initially dependent on a contractile ring of actin as a way to seal rapidly the membrane of damaged opisthokont cells. This is a possible branch point from chytrid-like opisthokont to animal- (choanozoan-) like opisthokont, with the animal stem gradually losing wall and adapting cytoskeletal organisation/vesicle trafficking originally used in wall synthesis to the new function of phagocytosis, and developing disassembly of the nuclear envelope to form the division spindle, cholesterol as the predominant sterol for membrane fluidity, and equatorially contractile cell division. Through this sequence of events the chytrid-like opisthokont evolved towards filamentous fungi and emerged over 1.5 billion years ago as the first crown group of eukaryotes. Now read the paper by following the hyperlinks to sections 1 to 5 via the navigation panel on the left, or, if you prefer, you can download a PDF version of the paper [CLICK HERE TO DOWNLOAD]. 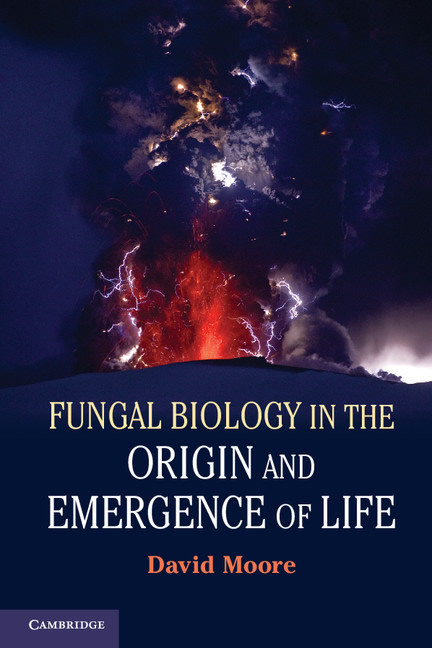 If you are interested in topics like the origin of life on Earth, the full story is told in David Moore’s new book Fungal Biology in the Origin and Emergence of Life which is to be published by Cambridge University Press (ISBN: 9781107652774) from January 2013. No other book uses as its principal premise the notion that fungi held a central position in the evolution of the eukaryotes. The argument is speculative, but the principal idea is plausible and supported by some compelling evidence.